I was provided a bouncer at no cost to facilitate this born free kova baby bouncer review. As I am preparing for baby, I have been overwhelmed with the amount of baby gear made for babies. How do you chose if you want or need a swing? A pack-n-play? How about a bouncy seat? A playpen or activity center? My husband and I are not sure how much baby furniture we want to take over our living space and want to make smart choices to keep things minimal. When I was offered the chance to do a review for the born free kova Baby Bouncer, I jumped right on it. I knew this is one product that we would want to have. My husband and I are blessed to live in a larger-sized home. Our house has several rooms, two living rooms, and is a two-story house. We knew that we wanted something that was portable and could move from room to room. We needed something that will hold the baby but doesn’t need to plug in. 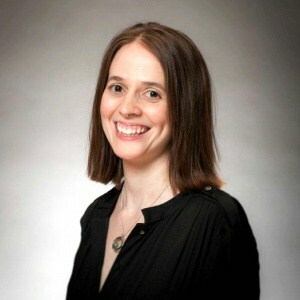 I also want to be able to move it from room to room with one hand, while safely carrying the baby in the other. Therefore eliminating the need to have a different safe space for baby in every room of the house. The born free kova baby bouncer meets all of those needs. We are busy people. We have learned how to get up and out of the house in record time. This is guaranteed to change once the baby is here! The more “travel-friendly” items we can have the better! That is why I love that the born free kova baby bouncer comes with a travel case. The case has a drawstring top and a nice, heavy duty and long strap. It is easy to throw over your shoulder and carry it out to the vehicle and into the trunk. Maybe it’s just me, but I just don’t understand why baby items so often look obnoxious? I love beautiful items. I love baby things that will complement the colors and style of my home. Once the baby is in the bouncer, I can almost guarantee that the baby will not care what colors or exotic animals are on the fabric. I, however, do care. 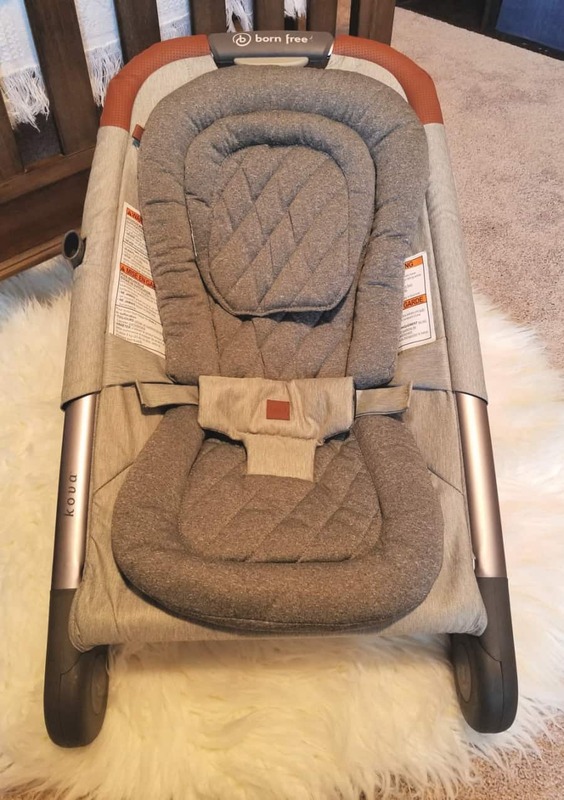 The born free kova baby bouncer is designed with premium fabrics and a soft, comfortable newborn insert. It is a mix of light gray, dark gray with some brown leather. The sleek silver metal makes it look like something that deserves to be on display when not being used. 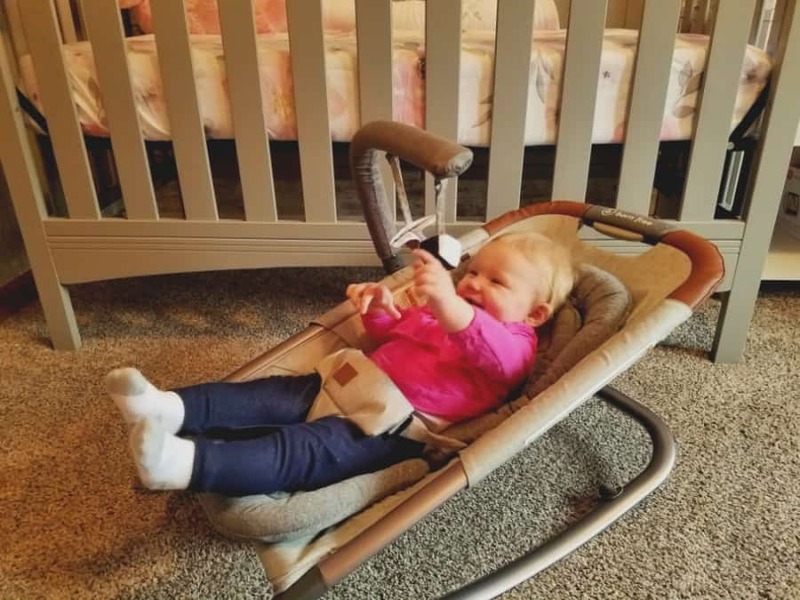 This baby bouncer comes pre-assembled and ready to use right out of the box. You simply push the button on the back of the bouncer and can raise the seat to one of two settings, bouncer or rocker. You can adjust the feet to change it from rocking mode to a stable, sitting position. Simply push the button to collapse it back down for travel or a store away position. The infant insert is easily removable and machine washable for quick mess clean up. If you are looking for a safe space to place your baby. 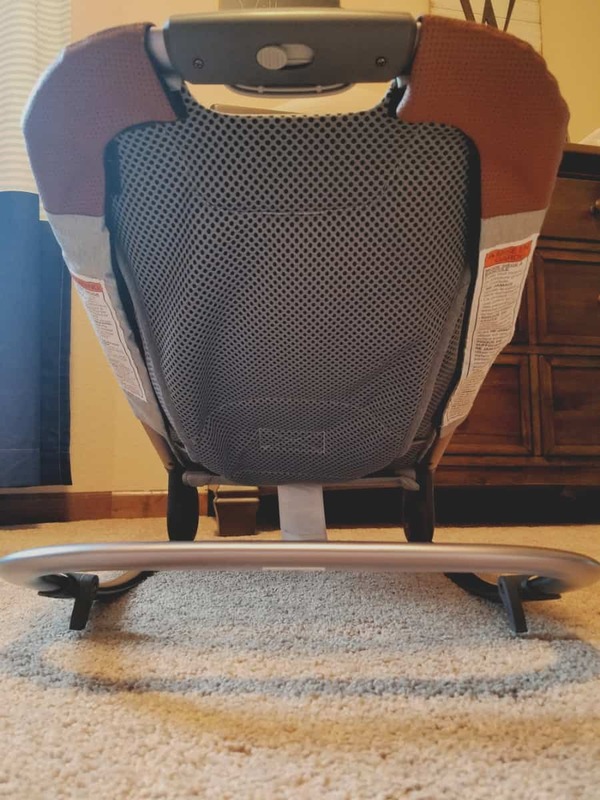 Specifically, one that is beautiful, easy to transport, has multiple functions and of high quality, then check out the born free kova baby bouncer and their other great safe spaces for baby found on their website. You can find this bouncer to purchase at Amazon. I’m excited today to offer our readers the chance to WIN a born free kova baby bouncer. If you’d like a chance to win, just enter using the Giveaway Tools entry form below. Good luck! Disclosure: This giveaway is not affiliated with Facebook, Pinterest, Instagram, or Twitter. Born free is responsible for prize fulfillment. Love the color! Something that’s not circus colors and match my house! I like that you can adjust the feet to change it from a rocking mode to a stable position. I would love to win this for my stepbrother because he and his wife are expecting in July! I love that it has two settings as a bouncer and rocker. It also looks very comfy and I love the color. I would like to win it for my son who is 2 months old. This bouncer is beautiful. The sleek design and elegant color scheme makes it welcomed in any home. It gives ‘class’ to baby gear. I like how adjustable the bouncer is. I’d love this for may niece who is due any day now! I like that it can be a rocker or bouncer. I’d love to give this to my friend who is due next month. I like how safe it is and that it can even be adjusted… 2 in 1! I like that this bouncer is preassembled and ready to use right out of the box. I’d like to have one because it would make a great gift. I love that it easily adjusts to your baby’s liking. I’d love it for my baby.